When she's not shooting mukbangs, makeup tutorials, and travel vlogs, beauty influencer Anna Cay is busy serving cool and casual looks we all want to copy. She invests in upgraded basics that she can always re-style and re-wear. Take a look at our fave outfits of hers below! Here, she shows us how well dove gray and pastel pink go together. Plus, she proves that midi skirts look great on petites. If you're looking for a fresh AF summer outfit, choose to wear all white! See how a leather biker jacket makes a big difference? Okay, this look makes us want to live in oversized hoodies forever. Nothing is more cool and casual than her black jacket + skinny jeans + crossbody bag + sock sneakers + white tank. Elevate your usual white tank and denim shorts with a tailored blazer and a belt bag. Side-split button trousers make a comfy alternative to jeans. Take note that she's wearing a white tank again, proving its versatility as a closet item. She layered a basic white top with a beige trench and a neutral-hued scarf. Jeans, a black leather belt, and a pair of white sneakers complete her look. 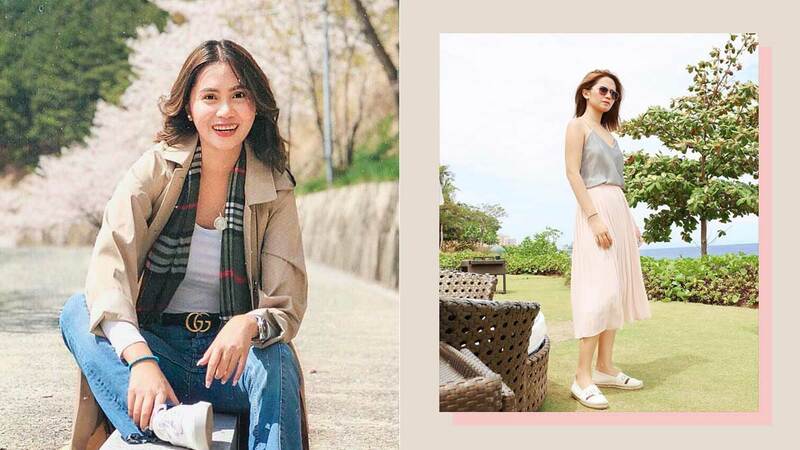 We hope she posts more OOTDs because we're loving her style! Tell us your fave Anna Cay look in the comments.